I just returned from the fabulous Bermuda Regional. It was a successful week - my team won two of the three main events - but more importantly it was an incredible amount of fun. I played with Jean Johnson, one of Bermuda's top players, and Bill Souster, a former Bermudian now living in Wales. Both of my partners played admirably. I played the pair events with Jean and platooned the team events with Jean and Bill. The tournament started well with Jean and I coming in third in the Charity Pairs. The opponents led two rounds of clubs. I pitched a heart, went to the king of diamonds, and finessed the ten of diamonds on the way back, which won, lefty pitching a club. I then cashed the ace of diamonds. 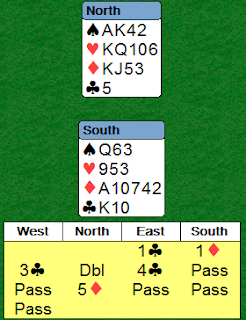 I was hopeful for a 3-3 spade break to pitch my second heart loser, but queen - king - ace of that suit showed a 4-2 break (LHO holding 4). My next attempt was to play a top heart, hoping RHO would win and be endplayed into leading another heart or giving me a ruff-sluff. RHO did win and conceded. As it turned out, if she had ducked, my last try would have been successful - ruffing a spade to hand and leading a heart to the ten. More hands and results soon!